WAIST HIGH: Mick Hucknall Apologizes To The Thousands Of Women He Slept With. Mick Hucknall Apologizes To The Thousands Of Women He Slept With. "A red-headed man," Mick Hucknall modestly acknowledges, "is not generally considered to be a sexual icon," although that did not stop the singer from using his own curly red locks to remarkable seductive effect at the height of his fame in the mid- 80s, when he estimates he slept with more than 3,000 women in three years. In an interview with Rob Fitzpatrick of the Guardian Hucknall said he regrets the philandering, "In fact, can I issue a public apology through the Guardian? They know who they are, and I'm truly sorry." 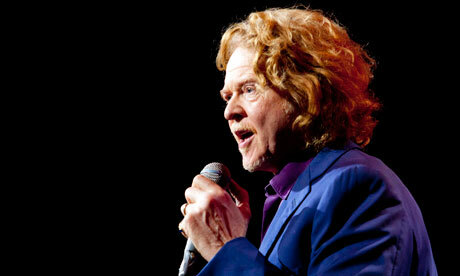 From guardian.co.uk: Hucknall, 50, is originally from Manchester and achieved huge success with Simply Red. His brand of romantic soul ballads won him ridicule from critics but many female admirers. "When I had the fame, it went crazy," he says. "Between 1985-1987, I would sleep with about three women a day, every day. I never said no. This was what I wanted from being a pop star. I was living the dream and my only regret is that I hurt some really good girls." Hucknall, who in the past was linked among others to Catherine Zeta Jones, Martine McCutcheon and Helena Christensen, is married with a young daughter. He attributes his sexual incontinence to a search for love, after being abandoned by his mother at three. "I wanted love from every single woman on the planet because I didn't have my mother's love. It was an addiction that took me to my darker period from 1996 to 2001, when I really came close to the gutter - I was more into drinking than seducing." Ultimately, he said, he got bored with his sexual adventuring "as I never really got the emotional contact that I craved." Having been slammed for his soft soul music, Hucknall describes himself as "the boy everyone loves to hate," but says that after 25 years and more than 50m album sales he plans to retire the Simply Red name - he is the only remaining original member - and "write songs in my little corner. I don't want to be a slave to commercial success any more. I've been set free. I can do whatever I want now."